I would like to thank my family, friends, co-workers and colleagues for their kind support in my Walk a Mile in her Shoes Fundraiser. With your help and generosity, I was able to raise more than $1,200 for the YWCA’s Family Violence Protection programs. And, I was named the top individual fundraiser for the event. The drag queen-like mauve stiletto pump trophy is proudly displayed in the deVine Wines window for all to admire! I must admit though, pink is NOT my color. On Sep 14, more than 200 men came out to raise awareness of the serious issue of family violence. As a board member of the Downtown Business Association, I am proud to be in this group of fine men who came out to put their best foot forward in addressing this social problem. 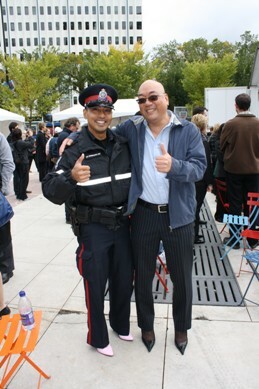 Donations can still be made here..
For your delicious entertainment, here is a picture of EPS Community Liaison Constable Will Hermosura and I hamming it up. Will and CLC Candace Werestiuk have been instrumental in helping keep 104-St and the downtown area safe by working closely with our community. 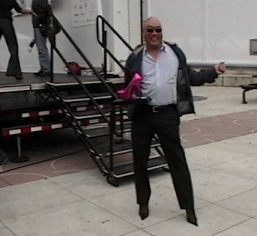 Thank you to the twenty fine members of the Edmonton Police Services who came out in heels to support the YWCA. Are you man enough to fill these shoes? Well, Ed is! Ed will slip into a pair of sky high stiletto pumps on Sep. 13 to raise awareness, money and show support for the YWCA’s Family Violence Prevention Program. The event takes place downtown between 11:30 AM and 1:30 PM at Sir Winston Churchill Square. Ed will be walking, stumbling, tripping and toppling over as a representative of deVine Wines and the Downtown Business Association. His goal is to raise $2,000 for the YWCA. As of Sep 10, he has reached 45% of his goal through the kindness of his fellow coworkers, industry partners and business colleagues. Thank you all very much for your fantastic support! You can support Ed and the YWCA by coming out to cheer him on or by making a donation. Your hard earned dollars will greatly ease Ed’s embarrassment and support a very worthy cause. If any men out there would like to join us in this adventure, you can sign up here..
Real men from Edmonton Police Services, Edmonton Fire Rescue Services, numerous arms of the media and even an Edmonton Oiler are coming out to show their support against family violence.